On cold days, do you feel the drafts whistling through your doors and windows? During a heat wave, does it feel like the A/C just isn’t working as hard as it used to? You can do more than throw on or take off a sweater and avoid the basement. A wide variety of public-purpose-funded energy efficiency programs are administered by California’s IOUs: Pacific Gas and Electric (PG&E), Southern California Edison (SCE), Southern California Gas (SoCal Gas), and San Diego Gas and Electric (SDG&E), and Southwest Gas Corporation (SWG) to help make your home more comfortable and energy-efficient. Drafts and leaks don’t just lead to hefty energy bills, they also increase your carbon footprint and contribute to climate change. In Ontario, where I’m from, almost one quarter of our total greenhouse gas emissions come from heating, cooling, and lighting our buildings. To meet our province’s climate targets, this needs to drop quickly. Not just for new buildings, but for the old creaky ones too – the one’s with lots of character. Home energy efficiency isn’t just about upgrading your appliances; it’s also about keeping outdoor temperatures from getting inside and comfortable indoor temperatures from leaking out. Air leakage around doors, windows, vents and electrical outlets can account for up to 25 per cent of your total heating costs. In fact, air sealing one of the most cost-effective, quick, and important things you can do to make your home more energy-efficient. Caulking and weather-stripping windows, doors, dryer vents, and other areas where air is escaping can offer huge savings, and make life a whole lot more comfortable. Improving your home’s insulation is another great way to stop heat (or cool air in summer) from flying out the door, wall, ceiling, or floor. Good insulation keeps your home warmer in the winter and cooler in the summer, meaning your heating or cooling system doesn’t have to work as hard. You can now get a rebate of up to up to $0.15/sq. Ft. to upgrade insulation in your attic or basement. 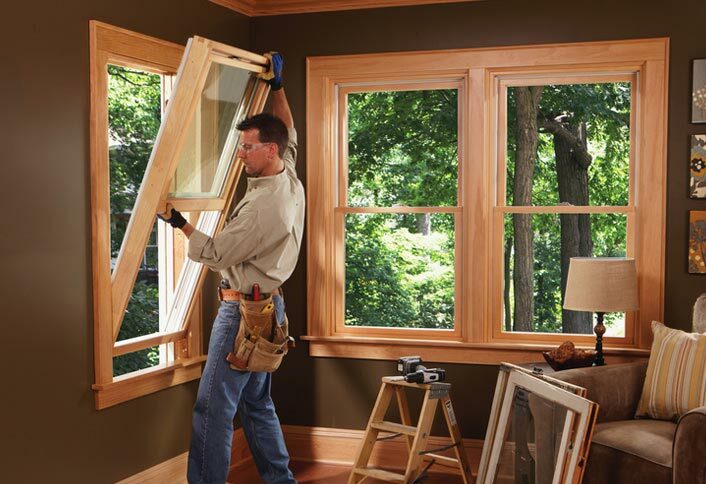 Before choosing to entirely replace your windows, you may be able to simply improve the ones you already have. Adding window treatments or coverings can reduce heat loss, and so can caulking and weatherstripping. You can install insulating window shades, add clear plastic film to the inside of your window frames to reduce drafts, or at the very simplest, reduce heat loss by closing your curtains at night to protect against cold drafts, and opening them in the daytime to let in warming sunlight. If you’re looking to entirely replace your current windows with energy-efficient ones, look for the ENERGY STAR symbol on home products to make sure they’re certified as energy-efficient. PG&E, SCE, SDG&E, and SWG offer prescriptive rebates for upgrading to more efficient windows. Once you’ve sealed up the drafts, it’s time to beef up your heating and cooling systems. Heat pumps are a little-known but very effective way to move freely-available heat to where it’s most needed. The system can also run in reverse in summer, extracting heat from inside and releasing it outside. You can now get up to $1000 cash back for the installation of an energy efficient heat pump in your home. If you’re starting on a home energy retrofit adventure, make sure to start with a home energy audit to see what your home needs most, and check out all the potential incentives before you begin. Every home is different, so it’s important to find the right solutions to maximize your impact. Keith is the Program Director at Environmental Defence in Toronto, Canada. He was born in the ‘burbs, but his passion for the environment was born in a canoe on the rivers and lakes of Northern Ontario. He firmly believes that we cannot choose between the environment and the economy. We can and must have both.